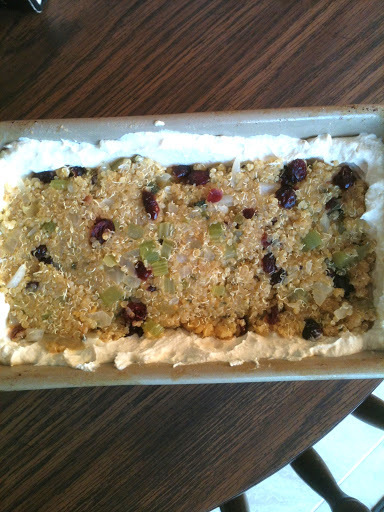 The final post for my Thanksgiving 2012 Meal, the best part…DESSERT! I made my favorite chocolate pie that I have already posted on my blog. The last time I made this pie, I used a date nut crust which I was not thrilled about. I think rich chocolate pie pairs better with graham cracker crust. However, it is very difficult to find a somewhat healthy vegan and gluten free graham cracker crust, so I decided to make my own out of homemade graham crackers. For this post I’m going to include 2 recipes. The first is how to make homemade vegan and gluten free graham crackers and the second is how to turn those graham crackers into a pie crust. Preheat oven to 350F. Line a baking sheet with foil and grease lightly with non-stick spray. In a food processor, pulse rolled oats into flour. Combine all dry ingredients in a large bowl and mix together. Pour wet ingredients into dry ingredients and stir until everything is combined. (Add extra water if needed, if it is too wet you may need to add more flour. You want to be able to form a ball with the dough. Once everything is combined, roll the dough into a ball with your hands and place on a sheet of wax paper. Place another piece of wax paper on top of the dough and using a rolling pin, roll the dough into a square forming a thin graham cracker width, or to your desired thickness. Cut the dough into squares to form your crackers and place on the prepared baking sheet. Pour the sticky crumbs into a prepared pie pan and firmly press onto the bottom and sides of the pie pan with your hands to form a crust. If you do not have enough crumbs to completely fill your pie pan, add more crumbs and almond milk until you have enough. Now you have a graham cracker crust that you can fill with any pie filling. Once you fill the crust with your favorite pie filling, just bake according to your pie’s directions! For the graham crackers, based on using Bob’s Red Mill GF Rolled Oats and Sorghum Flour and Silk PureAlmond Milk, this entire recipe yields approximately 745 calories and 17g protein. 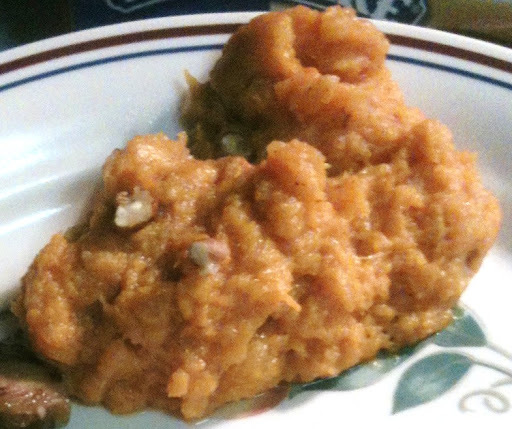 Today I am posting the other side dish in my Thanksgiving meal, Sweet Potato Casserole. 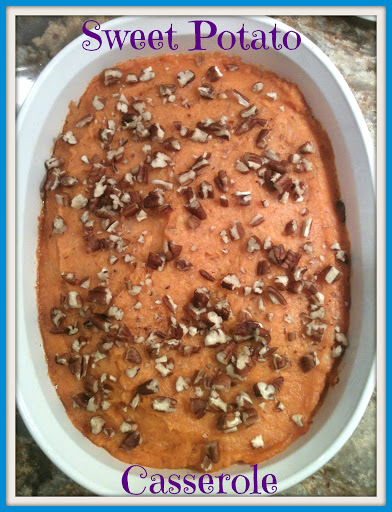 This is a recipe for the typical sweet potato casserole but obviously made vegan! Wash sweet potatoes (do not peel) and place them on a baking sheet lined with foil. Let cool enough so that you can remove the potato skins. The skins should peel right off with your hands. Place the peeled potatoes in a medium bowl. Add crushed pineapple, Earth Balance, cinnamon, and salt to the potatoes and mash until smooth. If needed add the extra pineapple juice. Place in a casserole dish, cover, and warm at 350F for 30 minutes just before serving. I had lots of compliments on this dish. The pineapple gave it a great sweetness and the pecans paired so well with the sweet potatoes! I loved how easy it was to make with very minimal clean-up. I will be making this again sometime very soon! Based on 1 serving, depending on the size of your sweet potatoes, this recipe yields approximately 193 calories and 3g protein. Now that I have covered the main dish of my Thanksgiving meal with the Homemade Tofurkey, Quinoa Sage Stuffing, and the Sage Gravy, it is time to continue on to the side dishes. In a large bowl, combine maple syrup (or agave), olive oil, and red wine vinegar. Set aside. Preheat a large skillet with a little olive oil. Add Brussels sprouts and fry until edges begin to curl and brown, about 6-7 minutes. Carefully add capers, they may splatter in the pan, and fry for 1 minute. Transfer cooked Brussels sprouts into the large bowl with the mixture prepared in the first step. If desired, season with salt and pepper. Mix everything together with a wooden spoon so the Brussels sprouts are evenly coated with the mixture. Right before serving, toss in the walnut pieces. These were really tasty and so easy to make that I’m definitely going to make these again as a side dish for dinner anytime. I’m roughly estimating that this recipe yields about 6 servings. 1 serving is approximately 123 calories and 4.5g protein. Now that I have posted the recipes for my Homemade Tofurkey and Quinoa Sage Stuffing, all that is missing is the gravy. Since the stuffing I used had sage in it, I thought this Sage Gravy would nicely complement the main dish of my Thanksgiving meal. This recipe was adapted from Happy Herbivore. I doubled the original recipe and used Bob’s Red Mill Gluten Free Brown Rice Flour to keep the gravy gluten free, but whole wheat flour works as well. Combine all ingredients in a medium pot and whisk together over high heat until the mixture is just about to boil. Remove pot from the hot burner and give it one last stir adjusting seasonings to your desired taste. This gravy is so creamy and the nutritional yeast gives it an almost “cheesy” taste. It is even a great gravy to use on top of vegetables. I love how easy this gravy is to make and you only have to clean one pot after. Since this recipe is so simple, I just might have to make this recipe more often and use it as a sauce over rice and vegetable bowls instead of using my typical marinara sauce or tamari to change it up a bit. About 1/4 cup serving yields approximately 35 calories and 2.5g protein. Yesterday I posted about the main dish of my Thanksgiving dinner, my Homemade Tofurkey. 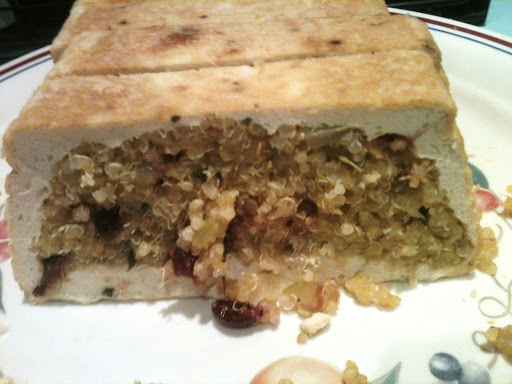 I mentioned how you could fill it with any stuffing and I decided to stuff mine with Quinoa Sage Stuffing. 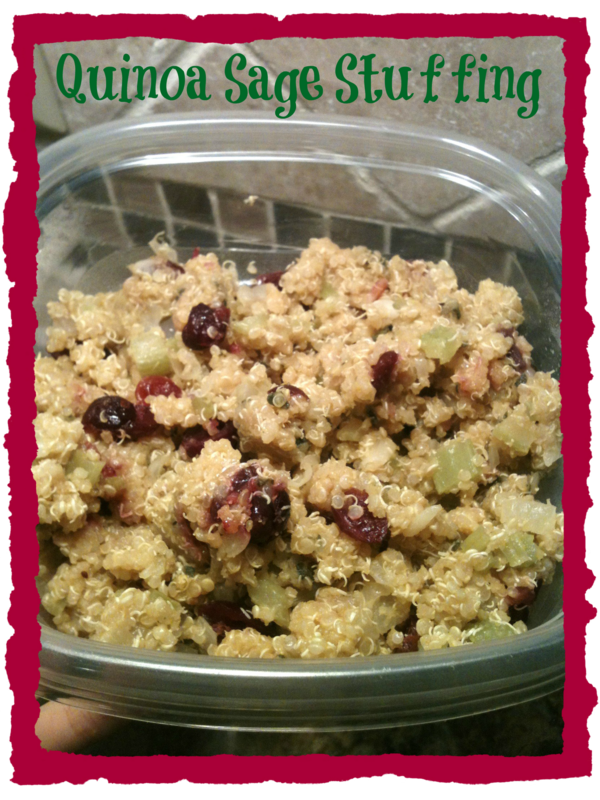 The ingredients in this stuffing sounded perfect for the flavors of the holiday! In a medium sized pot, bring vegetable broth to a boil. Stir in the quinoa and bay leaf. Set to low heat and simmer, covered, for 10 minutes. After 10 minutes, turn off the heat and allow the quinoa to steam, covered, for another 10 minutes. Heat the olive oil in a large saute pan over medium low heat. Add in the celery and onion and cook until translucent, about 10 minutes. Turn the heat to medium and add in the sage, garlic powder, salt, and pepper. Adjust seasonings to taste and simmer for a few minutes. You can also eat this just as a stuffing side dish. 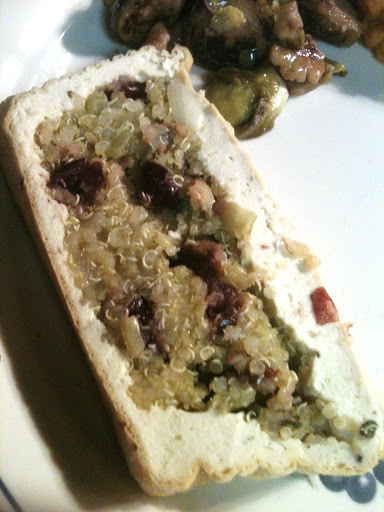 Just pour the quinoa stuffing into a casserole dish and bake at 375F for 10 minutes. Then, broil until the top becomes golden brown. You can do this just before serving!I loved that most of the stuffing went into the tofurkey, but I had extra to enjoy as a side dish! I’m roughly estimating that this recipe makes about 6 cups of stuffing. Based on about 1 cup, this recipe yields approximately 175 calories and 4g protein. Over the next few posts, I will include the recipe for each of these dishes. Let’s start with the main dish, my Homemade Tofurkey. Since packaged Tofurkey is not gluten free, I had to find something else to replace the main part of my Thanksgiving meal and I came across a homemade tofurkey and was surprised at how easy the recipe was to make. I highly recommend giving this a try. It was easy to make and tasted great! Preheat oven to 350F and grease a large loaf pan with non-stick spray. Drain tofu and pat dry as much as possible. (You can also prep the tofu ahead of time and let it air dry for an hour or so before patting dry the rest of the moisture.) Crumble the tofu into small pieces. Place the tofu and the rest of the ingredients in a food processor and blend until smooth. Add additional seasonings or more vegetable broth to your desired taste and blend until combined. Measure out a heaping cup of tofu mixture and set aside. With the remaining tofu mixture, spread a layer on the bottom and all sides of the loaf pan. Firmly, but gently press your stuffing into the pan. Loosely cover the pan with aluminium foil so the foil is not touching the tofu but is “tented” over the top and bake for 50 minutes. Remove the foil and cook an additional 20 minutes or until golden brown on top. *Any kind of stuffing will work to fill your tofurkey. I used Quinoa Sage Stuffing. It worked out really well because I used most to fill the tofurkey but had some leftover to be eaten as a side dish. As I made this I was really nervous because this was my first time making this dish and if it didn’t come out right I did not have a backup Thanksgiving meal main dish. However, I was very surprised at how well it came out. 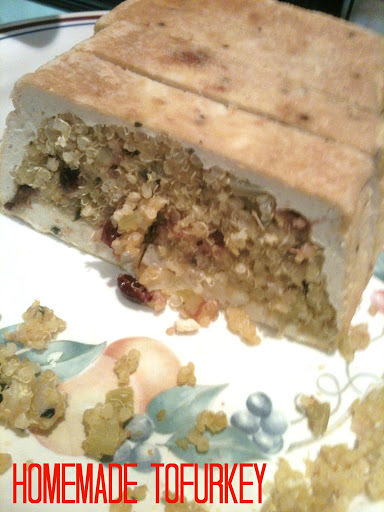 Not only did it unmold really nicely, but when I sliced it and took a serving the stuffing stayed nicely packed in the center of the tofu. I wonder if it helped stay together so nicely since my tofurkey was cold when I unmolded it, sliced it, and grabbed a serving? with the stuffing before adding the tofu mixture on top. My tofurkey before adding Sage Gravy on top! Since this tofurkey can be made with any stuffing, for the tofu mixture only the entire recipe yields approximately 780 calories and 72g protein. Based on 8 slices, each slice is approximately 185 calories and 11g protein. Here is a great snack with tons of nutrition giving you that perfect energy boost before a workout! Soak dates in warm water for about 2 hours to soften. Alternatively, you could heat them in the microwave for about 20 seconds. Combine all ingredients, except almonds, in a food processor and blend until everything is combined. Place the block in the fridge to chill before cutting into 8 bars. Rewrap each bar in wax paper and keep refrigerated. Since these bars are individually wrapped, they are a quick snack to grab on the run. Or, instead of making bars, try cutting them into smaller bite-sized snacks for a small treat to help satisfy that sweet tooth! 1 bar yields approximately 178 calories and 4.5g protein. 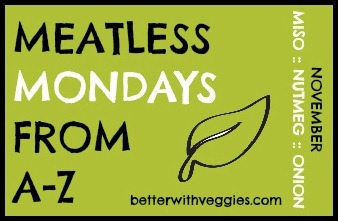 This Monday we are on the letter “O” for Meatless Mondays from A to Z and “O” is for Onions. Similar to last week’s Nutmeg post, onion is a common ingredient I use in many dishes, but not as the main component. I do not like onions at all, unless they are well-cooked into a main dish. This weeks post does not really highlight onions. 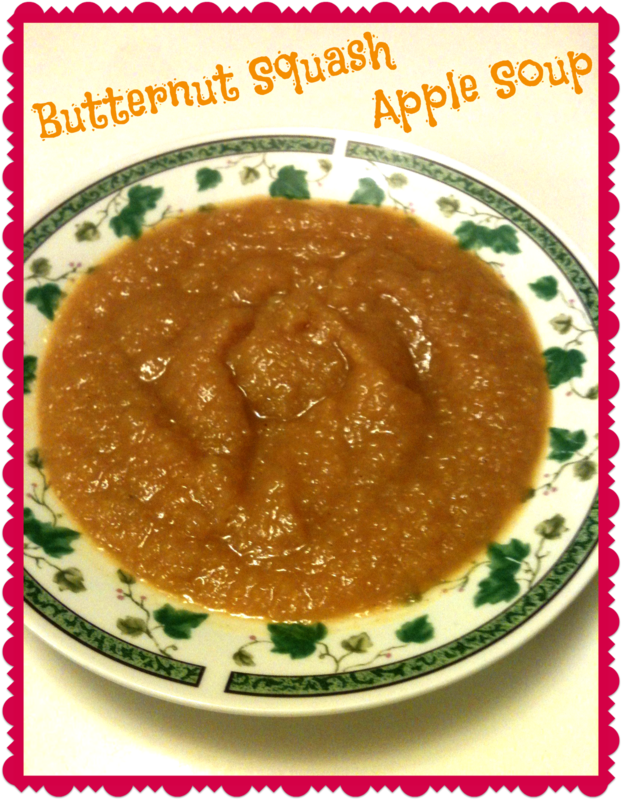 But that is okay because it highlights two of my favorite fall ingredients, butternut squash and apples. 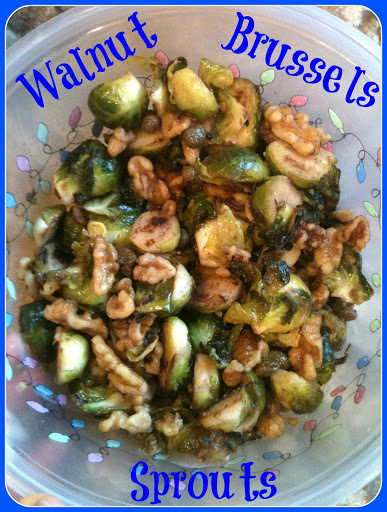 This is a great fall dish, especially with Thanksgiving coming up! If using fresh butternut squash, peel and remove all seeds; then chop it into pieces. Chop the onions into chunks. In a large pot, combine squash, apples, onion, and vegetable broth. Bring to a boil. Remove from heat and let it slightly cool. In small batches, transfer soup to a blender and puree until smooth. Once pureed, season soup with cinnamon, ginger, nutmeg, cayenne, and salt and pepper. This would be great topped with hemp seeds, pumpkin seeds, squash seeds, etc. Also, several of the recipes I saw online also included carrots and celery. That seems like a great idea to add more vegetables! I might give that a try next time. If I do, I’ll update this post! This week is the letter N for Nutmeg in Meatless Mondays from A to Z. Since nutmeg is an ingredient I use a lot to spice anything with pumpkin, I wanted to try something new. I really wanted to bake muffins, cookies, or bars that would really highlight the flavor of nutmeg, but did not get the chance this past week; maybe sometime in the future. I still do have a recipe with nutmeg, but it definitely is not the main ingredient and since this recipe was so delicious I knew I still had to add it to my blog. 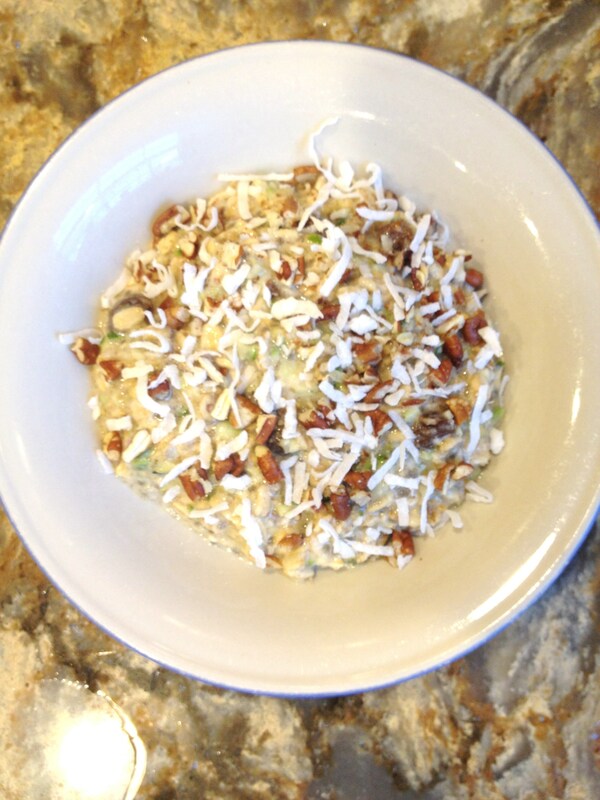 Combine oats and almond milk in a microwave-safe bowl. Heat for 3 minutes. Stir in chia seeds and let sit for 10 minutes. Place in fridge uncovered overnight. The next morning stir in the other ingredients and eat cold or reheat. Alternatively, you can just stir all ingredients together, microwave for about 3 minutes, and eat the morning of making this breakfast.Unfortunately, I do not have a good picture of this oatmeal. The chocolate peanut butter and orange pumpkin don’t make the prettiest oatmeal bowl. Maybe next time I make this I’ll sprinkle the top with dried fruit and walnuts for a prettier picture and some extra yummy toppings! Based on using original Silk PureAlmond milk and Trader Joe’s GF Rolled Oats, this recipe yields approximately 315 calories and 10.5g protein. I had a zucchini that needed to be used and wanted to use it in a creative way. I decided why not add it to my oatmeal in the morning. I had seen this done several times before and have always wanted to give this a try, especially because I love adding veggies to my breakfast in subtle ways. 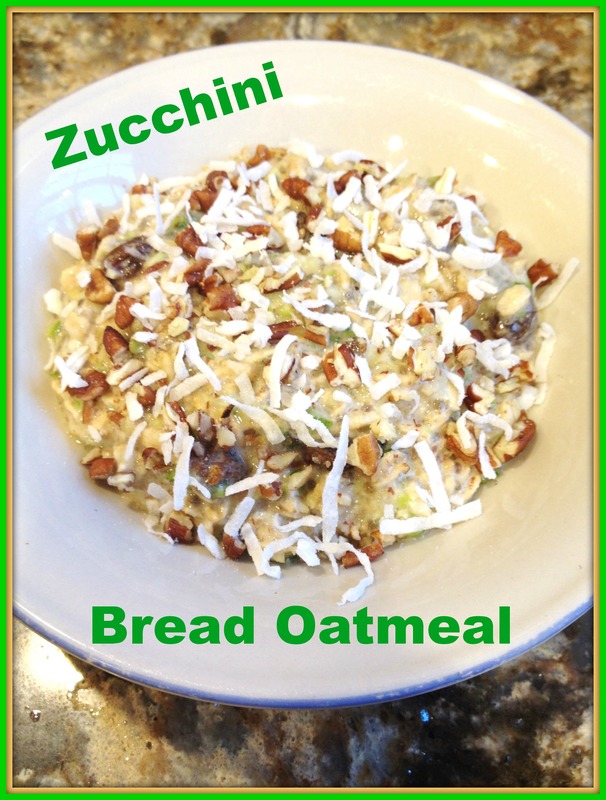 I love the pop of green color the zucchini gives to the oatmeal and it tastes more sweet than savory! Combine all ingredients except raisins, pecans, and coconut, and stir together. 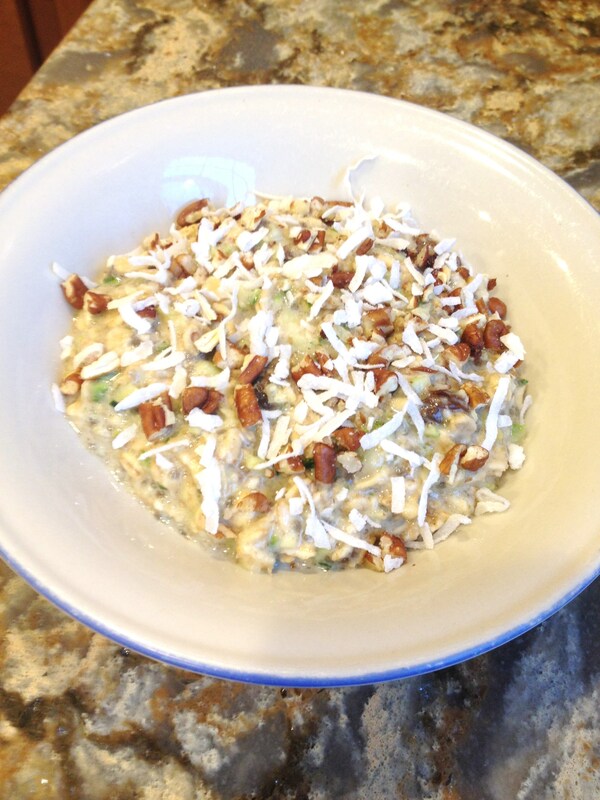 In the morning, Top the oats with raisins, pecans, and coconut and enjoy! You can also make this right before eating if short on time (but the oats won’t be as soft or have as much volume). You can also heat the oats in the morning if you don’t like them cold. However, if you prepare this the night before, breakfast is ready so quickly in the morning!